Our interpretations of the world we live in, and the people and institutions that comprise it, are acquired through complex interactions among what we believe to be true, what the world is, and/or what others think it is. Understanding those complex interactions is one of the most important goals of the social sciences. Of the many disciplines that have contributed to that understanding, two take center stage in this book -- psychology and communication. * a critique of the cognitive enterprise that reflects the strong philosophical grounding of communication. 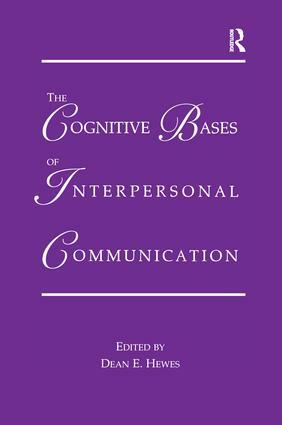 Overall, the chapters typify some of the most interesting cognitive work done in the study of interpersonal communication. As such, the book should promote productive dialogue across disciplinary boundaries and stimulate further work within the field of interpersonal communication.